Provide comfort for the family of Gregory Corcoran with a meaningful gesture of sympathy. the age of 68 on February 3, 2019 following a courageous battle with Lewy Body Dementia. Cherished husband of Krystyna for 34 years, loving father of Kyle. Loving brother to Randy William Corcoran, Sisters, Kim and husband Kevin, Lisa and fiance Alan and to all their children and nieces and nephews. Predeceased by Candice Rheeder and Kevin Corcoran Loving Uncle to Sean, Kelly and wife Shane and their children, and cousin to Rosemary and husband Paul and their children Loving nephew to Robert Wellington Corcoran and wife Ann and their family He was fun-loving with a great sense of humour, devoted to family. He loved the outdoors, and especially fishing. He went to Bayview Public School. Worked for his father delivering at Corcoran Foods, for his brother at Woodland making wood furniture. Had his own business painting and lawn cutting and worked for Canada Post for over 25 years until he retired. Greg will be fondly remember and forever loved by those whose lives he had touched. Relatives and friend may pay their respects at Marshall Funeral Home, 10366 Yonge St, Richmond Hill, Thursday, February 7, 2 – 4 p.m. and 7- 9 p.m. Service in the chapel on Friday, February 8 at 1:00 p.m. Interment Queensville Cemetery. Consider providing a gift of comfort for the family of Gregory Corcoran by sending flowers. To Krystyna, Kyle and all the family: I just found out today about Greg's passing, My thoughts are with all of you during this difficult time. I will never forget Greg's smile and his sense of humour and I will pray for him. So sorry to hear of Greg's passing. Our thoughts and prayers are with you at this very sad time. We have such fond memories. To Lisa, Alan & family of Greg, our deepest sympathies. 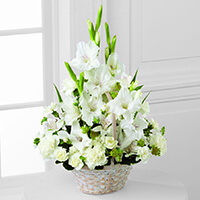 Jack & Elaine Mastrangelo purchased the The FTD Eternal Affection Arrangement for the family of Gregory Corcoran.